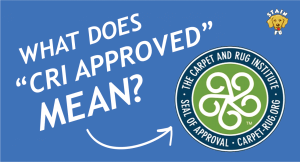 Home » Carpet Cleaning » What does CRI Seal of Approval mean? You may have noticed that our new product Stain Fu (formerly known as Rendall’s Certified Carpet Spot Remover) is “CRI Approved”. You may be wondering what that means, and why it matters? What is the Carpet Spotter Seal of Approval? If you are one of the many millions of people in the world who have carpeting, you may have purchased a spot cleaner for spills and stains. However, not many people know that a lot of those typical grocery store products and bathtub chemist mixtures you see on Pinterest are actually very bad for your carpet. This is why the CRI – The Carpet and Rug Institute – has developed a standard that measures the effectiveness of cleaning products and equipment. The CRI also partners with the scientists at NASA to help with the advanced testing. Yep, NASA – the space people! This way, samples can be tested with precision and from a reputable 3rd party source. Next time you buy a cleaning product, whether it’s a vacuum or a stain remover, check to see if it’s CRI approved. This way you have a better expectation (and more confidence!) before you buy.